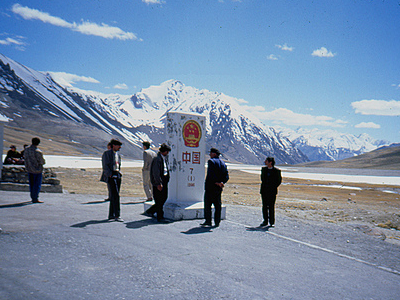 The Karakoram Pass is a 4,693 m or 15,397 ft mountain pass between India and China in the Karakoram Range. 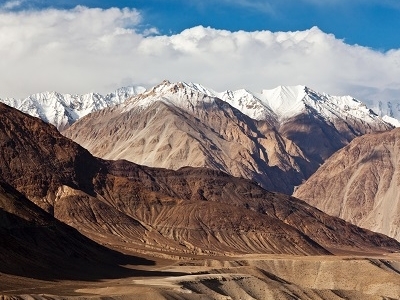 It is the highest pass on the ancient caravan route between Leh in Ladakh and Yarkand in the Tarim Basin. 'Karakoram' literally means 'Black Gravel' in Turkic.The high altitude and lack of fodder was responsible for the deaths of countless pack animals, and the route across the pass was notorious for the trail of bones strewn along the way. There is an almost total absence of vegetation on the approaches to the pass. To the south was the barren and feared three days' march across the Depsang Plains at about 5,300 m (17,400 ft). To the north, the country was somewhat less desolate before one had to cross the relatively easy and lower Suget Dawan (or Suget Pass) before reaching the lush grazing grounds around Shahidullah or Xaidulla in the upper valley of the Karakash River.The pass is in a saddle between two mountains and about 45 metres (148 ft) wide. There is no vegetation or icecap and it is generally free of snow due to the winds. Temperatures are low, there are often very high winds, blizzards are frequent, and the extreme altitude took its toll. In spite of all this, the Karakoram Pass was considered a relatively easy pass due to the gradual ascent on both sides, and lack of summer snow and ice much of the year. Consequently, the pass was open throughout most of the year.There is no motorable road across the pass, and the pass currently remains closed to all traffic. 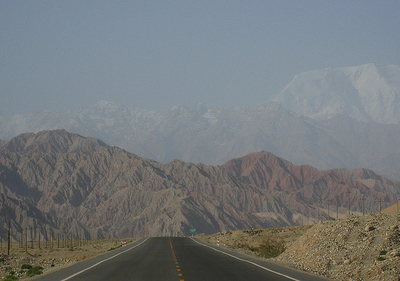 Here's the our members favorite photos of "Mountain Passes near Karakoram". Upload your photo of Karakoram Pass!